These highlights do not include all the information needed to use ACEON® safely and effectively. See full prescribing information for ACEON. To report SUSPECTED ADVERSE REACTIONS, contact XOMA (US) LLC at 1-800-718-9884 or FDA at 1-800-FDA-1088 or www.FDA.gov/Medwatch. Dual inhibition of the renin-angiotensin system: Increased risk of renal impairment, hypotension, and hyperkalemia (7.8). Use in Uncomplicated Hypertensive Patients: In patients with essential hypertension, the recommended initial dose is 4 mg once a day. The dose may be titrated, as needed to a maximum of 16 mg per day. The usual maintenance dose range is 4 mg to 8 mg administered as a single daily dose or in two divided doses. Use in Elderly Patients: The recommended initial daily dosage of ACEON for the elderly is 4 mg daily, given in one or two divided doses. Experience with ACEON is limited in the elderly at doses exceeding 8 mg. Dosages above 8 mg should be administered with careful blood pressure monitoring and dose titration [see Use in Specific Populations (8.5)]. Use with Diuretics: In patients who are currently being treated with a diuretic, symptomatic hypotension can occur following the initial dose of ACEON. 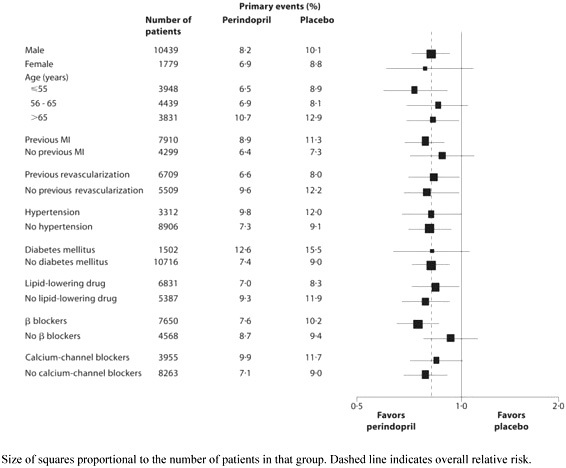 Consider reducing the dose of diuretic prior to starting ACEON [see Drug Interactions (7.1)]. Do not co-administer aliskiren with ACEON in patients with diabetes [see Drug Interactions (7.8)]. Head and Neck Angioedema: Angioedema of the face, extremities, lips, tongue, glottis, or larynx has been reported in patients treated with ACE inhibitors, including ACEON (0.1% of patients treated with ACEON in U.S. clinical trials). Angioedema associated with involvement of the tongue, glottis or larynx may be fatal. In such cases, discontinue ACEON treatment immediately and observe until the swelling disappears. When involvement of the tongue, glottis, or larynx appears likely to cause airway obstruction, administer appropriate therapy, such as subcutaneous epinephrine solution 1:1000 (0.3 to 0.5 mL), promptly. Symptomatic hypotension is most likely to occur in patients who have been volume or salt-depleted as a result of prolonged diuretic therapy, dietary salt restriction, dialysis, diarrhea or vomiting [see Dosage and Administration (2.1)]. Use of drugs that act on the renin-angiotensin system during the second and third trimesters of pregnancy reduces fetal renal function and increases fetal and neonatal morbidity and death. Resulting oligohydramnios can be associated with fetal lung hypoplasia and skeletal deformations. Potential neonatal adverse effects include skull hypoplasia, anuria, hypotension, renal failure, and death. When pregnancy is detected discontinue ACEON as soon as possible [see Use in Specific Populations (8.1)]. As a consequence of inhibiting the renin-angiotensin-aldosterone system, changes in renal function may be anticipated in susceptible individuals. Renal function should be monitored periodically in patients receiving ACEON [see Dosage and Administration (2.3)], [see Drug Interactions (7.8)]. In patients with severe congestive heart failure, where renal function may depend on the activity of the renin-angiotensin-aldosterone system, treatment with ACE inhibitors, including ACEON, may be associated with oliguria, progressive azotemia, and, rarely, acute renal failure and death. Elevations of serum potassium have been observed in some patients treated with ACE inhibitors, including ACEON. Most cases were isolated single values that did not appear clinically relevant and were rarely a cause for withdrawal. Risk factors for the development of hyperkalemia include renal insufficiency, diabetes mellitus and the concomitant use of agents such as potassium-sparing diuretics, potassium supplements and/or potassium-containing salt substitutes [see Drug Interactions (7.2)]. Hematology: Small decreases in hemoglobin and hematocrit occur frequently in hypertensive patients treated with ACEON, but are rarely of clinical importance. In controlled clinical trials, no patient was discontinued from therapy due to the development of anemia. Leukopenia (including neutropenia) was observed in 0.1% of patients in U.S. clinical trials [see Warnings and Precautions (5.3)]. Liver Function Tests: Elevations in ALT (1.6% ACEON versus 0.9% placebo) and AST (0.5% ACEON versus 0.4% placebo) have been observed in placebo-controlled clinical trials. The elevations were generally mild and transient and resolved after discontinuation of therapy. Patients on diuretics, and especially those started recently, may occasionally experience an excessive reduction of blood pressure after initiation of ACEON therapy. The possibility of hypotensive effects can be minimized by either decreasing the dose of or discontinuing the diuretic or increasing the salt intake prior to initiation of treatment with perindopril. If diuretic therapy cannot be altered, provide close medical supervision with the first dose of ACEON, for at least two hours and until blood pressure has stabilized for another hour [see Warnings and Precautions (5.2)]. ACEON may increase serum potassium because of its potential to decrease aldosterone production. Use of potassium-sparing diuretics (spironolactone, amiloride, triamterene and others), potassium supplements or other drugs capable of increasing serum potassium (indomethacin, heparin, cyclosporine and others) can increase the risk of hyperkalemia. Therefore, if concomitant use of such agents is indicated, monitor the patient's serum potassium frequently. Dual blockade of the RAS with angiotensin receptor blockers, ACE inhibitors, or aliskiren is associated with increased risks of hypotension, hyperkalemia, and changes in renal function (including acute renal failure) compared to monotherapy. Closely monitor blood pressure, renal function and electrolytes in patients on ACEON and other agents that affect the RAS. Pregnancy Category D [see Boxed Warning and Warnings and Precautions (5.4)]. Use of drugs that act on the renin-angiotensin system during the second and third trimesters of pregnancy reduces fetal renal function and increases fetal and neonatal morbidity and death. Resulting oligohydramnios can be associated with fetal lung hypoplasia and skeletal deformations. Potential neonatal adverse effects include skull hypoplasia, anuria, hypotension, renal failure, and death. When pregnancy is detected, discontinue ACEON as soon as possible. These adverse outcomes are usually associated with use of these drugs in the second and third trimester of pregnancy. Most epidemiologic studies examining fetal abnormalities after exposure to antihypertensive use in the first trimester have not distinguished drugs affecting the renin-angiotensin system from other antihypertensive agents. Appropriate management of maternal hypertension during pregnancy is important to optimize outcomes for both mother and fetus. In the unusual case that there is no appropriate alternative to therapy with drugs affecting the renin-angiotensin system for a particular patient, apprise the mother of the potential risk to the fetus. Perform serial ultrasound examinations to assess the intra-amniotic environment. If oligohydramnios is observed, discontinue ACEON, unless it is considered lifesaving for the mother. Fetal testing may be appropriate, based on the week of pregnancy. Patients and physicians should be aware, however, that oligohydramnios may not appear until after the fetus has sustained irreversible injury. Closely observe infants with histories of in utero exposure to ACEON for hypotension, oliguria, and hyperkalemia [see Use in Specific Populations (8.4)]. Dosage adjustment may be necessary in renally impaired patients [see Dosage and Administration (2.3) and Clinical Pharmacology (12.3)]. The bioavailability of perindoprilat is increased in patients with impaired hepatic function [see Clinical Pharmacology (12.3)]. Absorption: Oral administration of ACEON results in peak plasma concentrations that occur at approximately 1 hour. The absolute oral bioavailability of perindopril is about 75%. Following absorption, approximately 30 to 50% of systemically available perindopril is hydrolyzed to its active metabolite, perindoprilat, which has a mean bioavailability of about 25%. Peak plasma concentrations of perindoprilat are attained 3 to 7 hours after perindopril administration. Oral administration of ACEON with food does not significantly lower the rate or extent of perindopril absorption relative to the fasted state. However, the extent of biotransformation of perindopril to the active metabolite, perindoprilat, is reduced approximately 43%, resulting in a reduction in the plasma ACE inhibition curve of approximately 20%, probably clinically insignificant. In clinical trials, perindopril was generally administered in a non-fasting state. Distribution: Approximately 60% of circulating perindopril is bound to plasma proteins, and only 10 to 20% of perindoprilat is bound. Therefore, drug interactions mediated through effects on protein binding are not anticipated. Metabolism and Elimination: Following oral administration perindopril exhibits multicompartment pharmacokinetics including a deep tissue compartment (ACE binding sites). The mean half-life of perindopril associated with most of its elimination is approximately 0.8 to 1 hours. Elderly: Plasma concentrations of both perindopril and perindoprilat in elderly patients (greater than 70 years) are approximately twice those observed in younger patients, reflecting both increased conversion of perindopril to perindoprilat and decreased renal excretion of perindoprilat [see Dosage and Administration (2.1) and Use In Specific Populations (8.5)]. Heart Failure: Perindoprilat clearance is reduced in congestive heart failure patients, resulting in a 40% higher dose interval AUC. Renal Impairment: With perindopril doses of 2 mg to 4 mg, perindoprilat AUC increases with decreasing renal function. At creatinine clearances of 30 to 80 mL/min, AUC is about double that at 100 mL/min. When creatinine clearance drops below 30 mL/min, AUC increases more markedly. In a limited number of patients studied, perindopril clearance by dialysis ranged from about 40 to 80 mL/min. Perindoprilat clearance by dialysis ranged from about 40 to 90 mL/min [see Dosage and Administration (2.3)]. Hepatic Impairment: The bioavailability of perindoprilat is increased in patients with impaired hepatic function. Plasma concentrations of perindoprilat in patients with impaired liver function were about 50% higher than those observed in healthy subjects or hypertensive patients with normal liver function. Perindopril's effects on blood pressure were similar when given alone or on a background of 25 mg hydrochlorothiazide In general, the effect of perindopril occurred promptly, with effects increasing slightly over several weeks. The mean age of patients was 60 years; 85% were male, 92% were taking platelet inhibitors, 63% were taking Î² blockers, and 56% were taking lipid-lowering therapy. 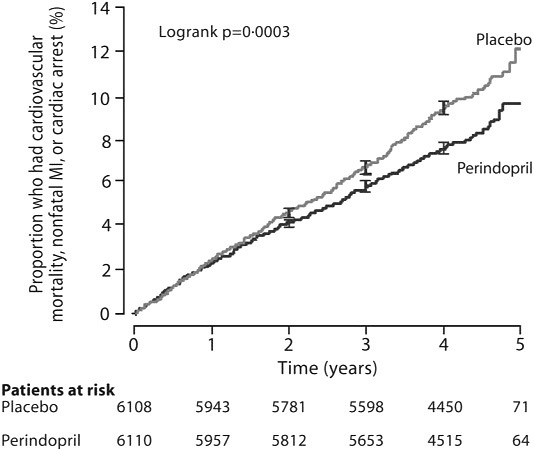 The EUROPA study showed that perindopril significantly reduced the relative risk for the primary endpoint events (Table 1). This beneficial effect is largely attributable to a reduction in the risk of nonfatal myocardial infarction. This beneficial effect of perindopril on the primary outcome was evident after about one year of treatment (Figure 1). The outcome was similar across all predefined subgroups by age, underlying disease or concomitant medication (Figure 2). For further information, please call our medical communications department toll-free 1-800-718-9884.